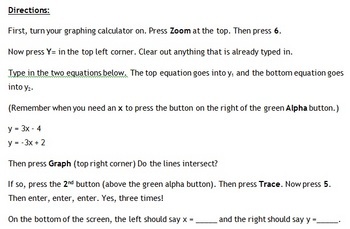 I used this at the beginning of my unit on solving systems of equations in Algebra 1. We talked about the first paragraph together and created definitions of solution and no solution as a class. Students then worked individually using TI-84 graphing calculators and followed step-by-step directions to graphing a system of equations example. Once I checked their example for accuracy, they turned the paper over and went to work graphing and finding the solutions of systems of equations. 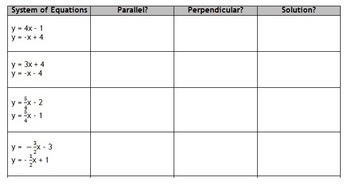 Problems include integers, fractions, parallel, perpendicular,and intersecting lines.